Keeping up with web developing standards can feel like a neverending race. Not only are you working to produce compliant code, but you want the multimedia content available to as many visitors as possible. This is especially true for mobile users, who often lack codecs that desktop users take for granted. The MP4 format is losing steam in the race to modern development. Even though it is widely supported, it isn’t always a sound choice for all mobile devices due to its patent-burdened nature. Flash is another common format, except that it doesn’t allow cross platform compatibility. Apple users are out in the cold. The new rising star, WebM, is open source, free of patents, and roughly equal in quality to MP4. The majority of users won’t see the difference. One downside to consider is that WebM isn’t as easily supported in IE and Safari. Users may need a small addon from the WebM project site to support the format. How much time will it take to convert your work to WebM? Not long at all! To create the WebM files, drop them in a converter and let the software do the work for you. Once this is done, simply use the HTML5 code created by the software. 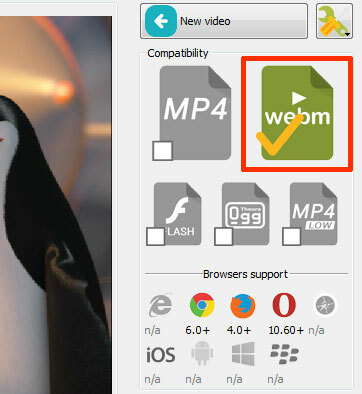 If you’d like to see for yourself how easy it is to convert your MP4 files to WebM format, check out EasyHTML5Video. It is a great mp4 to webm converter.